1.12oz Rectangle chocolate candy bar wrapped with your choice of colored foil. Imprinted label with photograph will be applied to the bar. Choose from milk chocolate candy, dark chocolate candy, white chocolate candy, or dark mint chocolate candy. 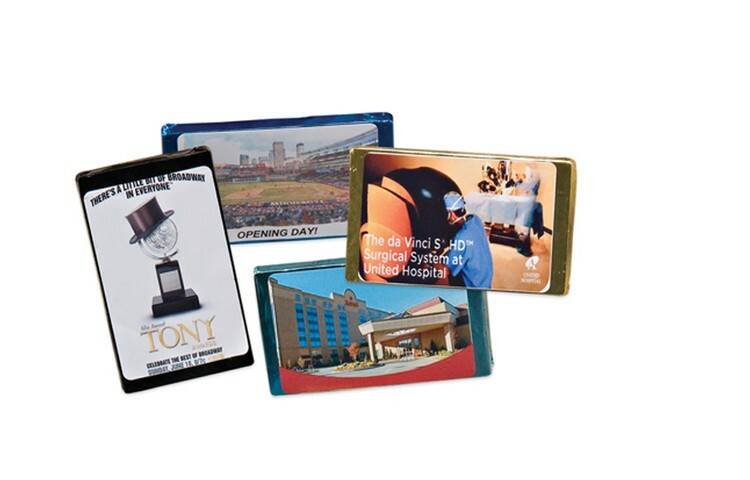 Makes a great food gift or promotional giveaway. Includes up to 4 color process imprinted label applied to the foil wrap.. Available in: milk, dark, white or dark mint chocolate. Available in 25 different foil colors. Copyright Shirt Media. All rights reserved.